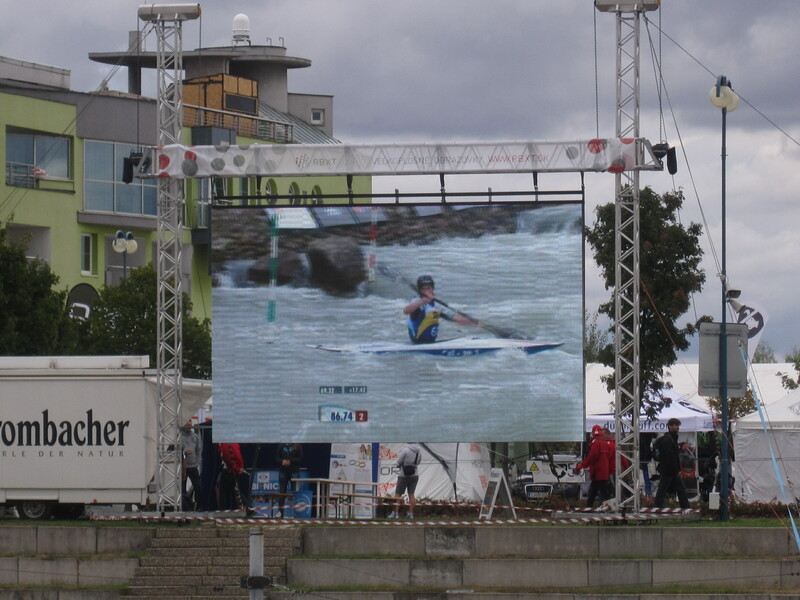 Terry was part of the Deep Creek 2014 Delegation that attended the 2011 Canoe Slalom World Championships in Bratislava, Slovakia. He went with the folks from Maryland and USA Canoe Kayak. Today we have another guest blog from Suzanne Nicolas, Event and Special Groups Coordinator at Adventure Sports Center International in Deep Creek and member of the leadership team for Deep Creek 2014! 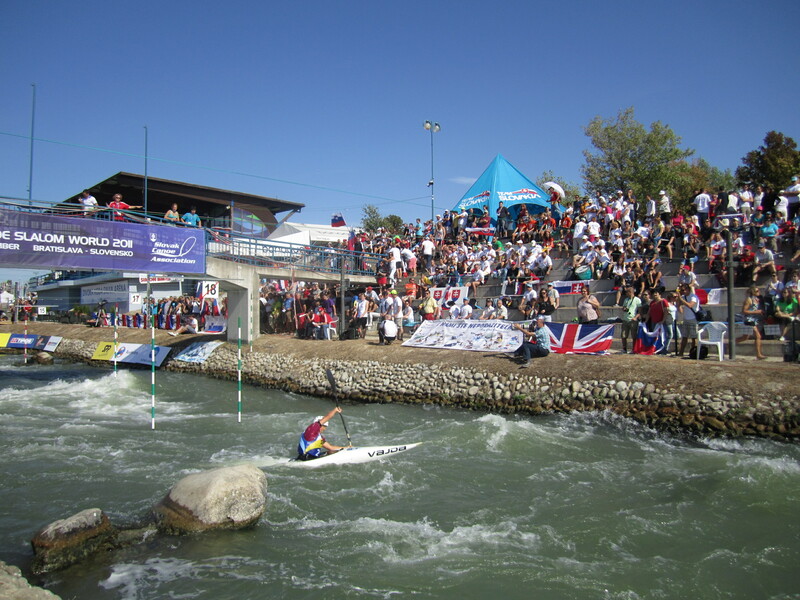 The 2011 ICF Canoe Slalom World Championships are over, and it was such an incredible experience on so many levels. The “Wow” factor of watching athletes compete at the Super Bowl of Whitewater was compounded by the pressure of claiming a spot for their country in the 2012 London Olympics next year. This was summed up by a huge banner that was placed at water level, just before the athletes paddled to the start line, reading, “Your Ticket to London”. The US Team’s Carolyn Queen and Scott Parson’s both secured boats for the US in Women and Men’s kayak. One event we do not normally see in the smaller competitions is the team race, where 3 boats from a country undertake the course all at once and must cross the finish line within a few seconds of each other. The skill and timing involved is intricate. The symmetry of the boats coming from a downstream gate and then crisscrossing each other’s bows as they turn to navigate an upstream gate, when well executed, is a work of art. The crowd noise is deafening during these events, as the crowd cheers not only for their team, but shows their appreciation of skills shown by all competitors. The Slovaks have a great appreciation of drama and it showed in the music choices during the racing. Rock ‘n roll was played as a backdrop and often was tied to specific racers or set the scene for the competition. 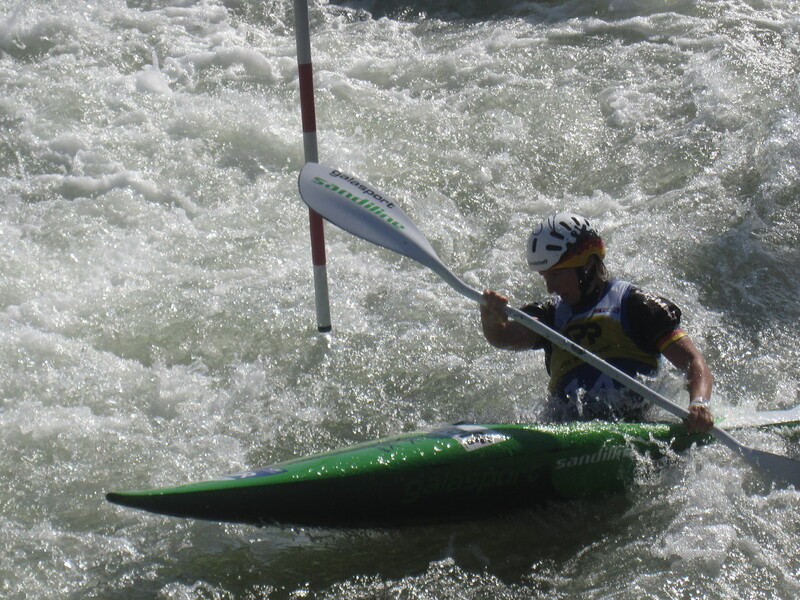 For example, when Peter Kauser (the “rock star” of whitewater from Slovenia) raced in the finals going for the Gold – the music was blasting Steppenwolf’s “Born to Be Wild”. During the women’s team race, they played Cyndi Lauper’s “Girls Just Wanna Have Fun,” and Bon Jovi’s “Livin’ on a Prayer” underscored one paddler’s try at making the finals. My personal favorite was when the Hochshorner brothers were racing their C-2 for a chance to not just medal, but the opportunity to make Olympic history with a fourth visit to the Games; the entire venue was stomping and clapping to Queen’s “We Will Rock You”. 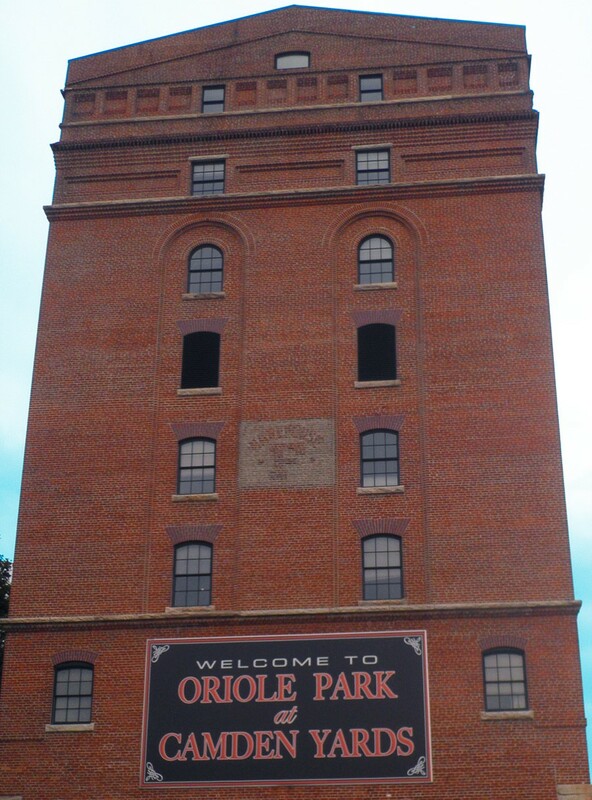 You can have a great venue, lots of ceremony and a good visitor experience, but it is all for naught without a good experience for the athletes and well-run competition. There is a tremendous amount of logistics and organization involved, including course set-up, judging, data and video services, television, and media services. I had the opportunity to meet with my peers from Slovakia, the Czech Republic, Spain, and France who were able to share their perspective and their challenges with hosting a World Championships. Additionally, with the day of postponed competition, we were able to get in-depth tours and instruction on the intricate media set-up, including the feeds going to all the teams that serve as the basis for protests and their outcomes. (During the competition more than 25 protests were handled). And lastly, the time we were able to spend with the US team was great. They are really looking forward to Deep Creek 2014 and having the home court advantage. We will have several training camps with them over the next 3 years, along with many of the international teams, who will be coming to check out the venue and trying to master our mountaintop course in Garrett County.